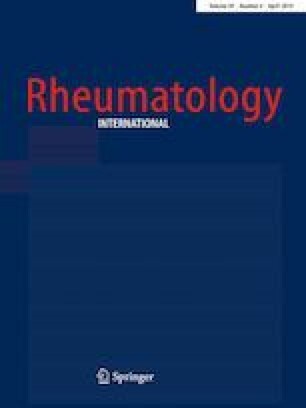 This study aims to investigate the global public interest in rheumatoid arthritis by evaluating search term popularity changes of the disease over a decade. Google Trends was applied to retrieve search popularity scores for the term ‘rheumatoid arthritis’ between January 2004 and December 2017, utilizing the category of “health”. Overall, relative searches volume for rheumatoid arthritis steadily decreased from January 2004 to December 2010, and then slowly rose from January 2011 to December 2017. There were significant seasonal variations in relative searches volume for the term ‘rheumatoid arthritis’ (Amplitude = 3.11; Phase: Month = 4.3; Low point: Month = 10.3; p < 0.025). Relative searches volume peaked in April and reached the lowest level in October. The top 11 rising topics were scleroderma, Anna Marchesini, C-reaction protein, osteoarthritis, arthritis, joint pain, autoimmune disease, rheumatoid factor, rheumatology, methotrexate, and systemic lupus erythematosus, ranking from high to low by relative growth of topic regarding rheumatoid arthritis. In conclusion, the evidence from Google Trends analysis demonstrates a significant seasonal variation in rheumatoid arthritis, with a peak in April. In addition, the top rising search queries are beneficial for physicians to search the Internet themselves for websites that provide high-quality information to recommend to their patients. GCW, SST, CNZ, YMM, and HFP conceptualized the study, participated in the study design, and revised the manuscript. GCW and CNZ wrote the manuscript. QW and YLD collected the data, conducted the statistical analysis, and revised the manuscript. All authors read and approved the final manuscript. The Doctoral research Grant from Anhui Medical University (XJ201712), and the scientific research grant from Anhui Medical University (2017xkj010) and the National Natural Science Foundation of China (81872687).